No roll required for Paratroopers to drop. No roll required for 150 Commando armor to make 1st turn movement. 2 x Day 1 SS Panzer Divisions held in reserve until afternoon of the first day. The Germans had a weak turn one start and failed to make significant progress, due to an inability to make a break-out on the first turn. 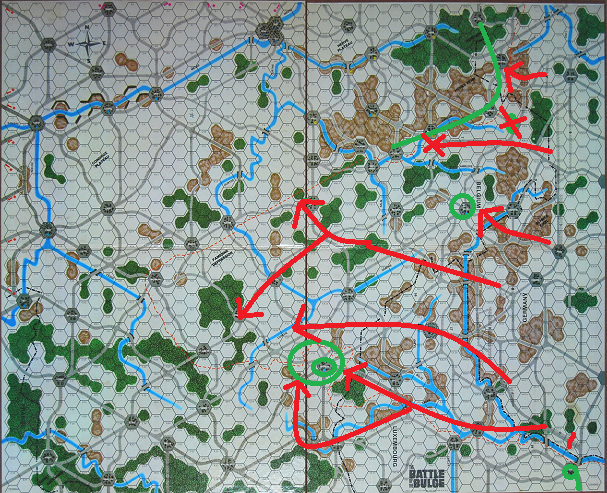 Allies managed to hold key strategic and tactical positions long enough to seriously bog down German progress along Elsenborn, delaying key reinforcements. After I’d managed to demolish the supply dumps at Stavelot and Spa, and following an entire division worth of panzers being eliminated south of Malmedy (poor troop placement, an attack at mediocre odds, and an unlucky roll meant the armor had no valid retreat paths, as they got trapped between ZOCs and a forest hex), my dad conceded. Also note that, though eventually dislodged, American units held certain locations long enough to delay key early-game SS reinforcements from arriving. I think in this play-through, and to a lesser degree the subsequent, my Dad failed to fully appreciate the need to only attack when a)astronomical odds or b)envelopment can be achieved. Anything less than 3:1 in a straight-up fight is pointless, unless you’re trying to buy time for additional troops to surround an enemy. Any chance you and the old man might give “One Page Bulge” a shot and compare the two games? As my first hex-and-counter wargame, that one has always had a soft spot in my heart. It would be interesting to learn how it compares to beefier affairs like this. If I had it, I’d be happy to try it out, but a minor basement flood wiped out a goodly portion of my dad’s magazine game collection, so even if he had it at one point, he likely doesn’t now.